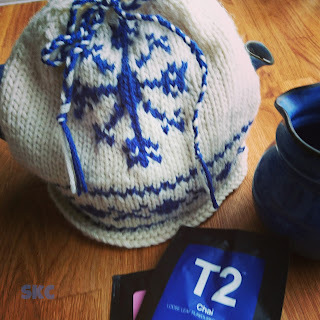 Lulu Loves Tea: Adventures in Knitting: Learning with my daughter! 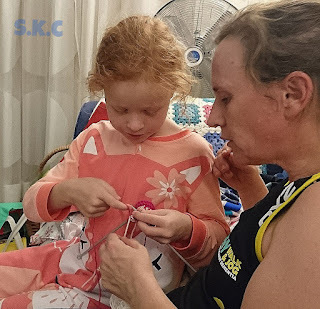 Adventures in Knitting: Learning with my daughter! I decided to take a break from my 300-stitches-in-a-row cardigan (which is coming along steadily, and should be ready in about a decade) to knit a tea cosy. Something achievable in under a month! 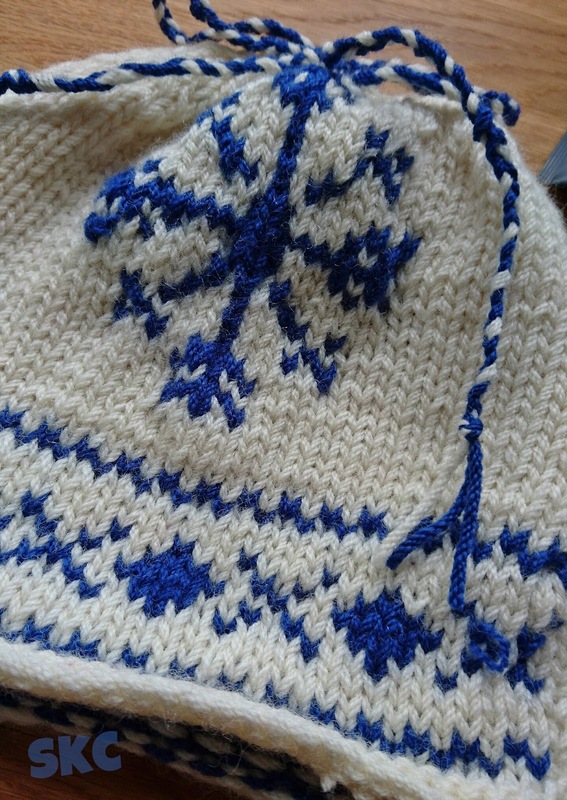 So I decided to have a go at at pattern which has a nordic style snowflake done in fair isle technique. 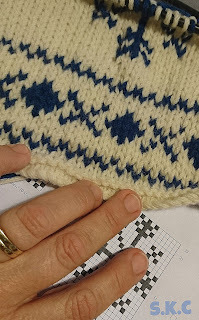 I've never done fair isle before, so this has been a great project to learn a new skill, while still being achievable. 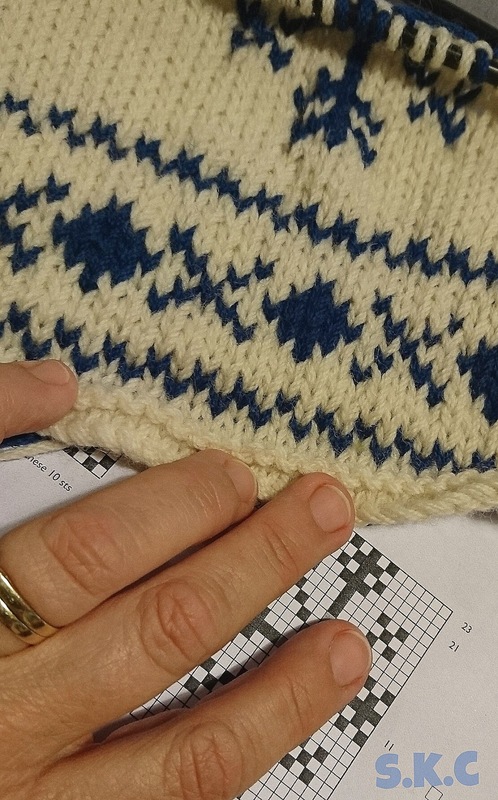 I've also been wanting to learn how to knit from charts for a while. I think it has been a good starting point to work from a colour chart - each box indicates the colour of the stitch (rather than a code chart - where each box in the graph has a symbol for the type of stitch). I did get a bit carried away and stopped reading the instructions, which led to predictable results. 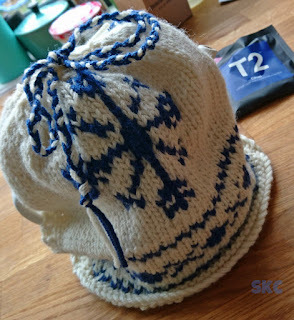 But seeing as it's just a Tea Cosy, I was pretty lazy about rectifying them. Which means that I mostly didn't. As I spent a day knitting along with other family also working at their creations, princess was watching us and investigating particularly how the charts work. 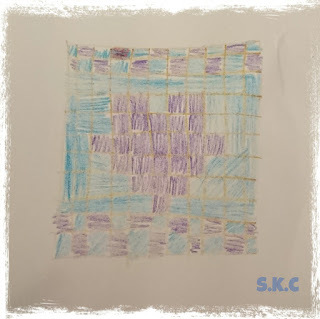 Once she had decided she understood how they worked, she set about designing one for herself. 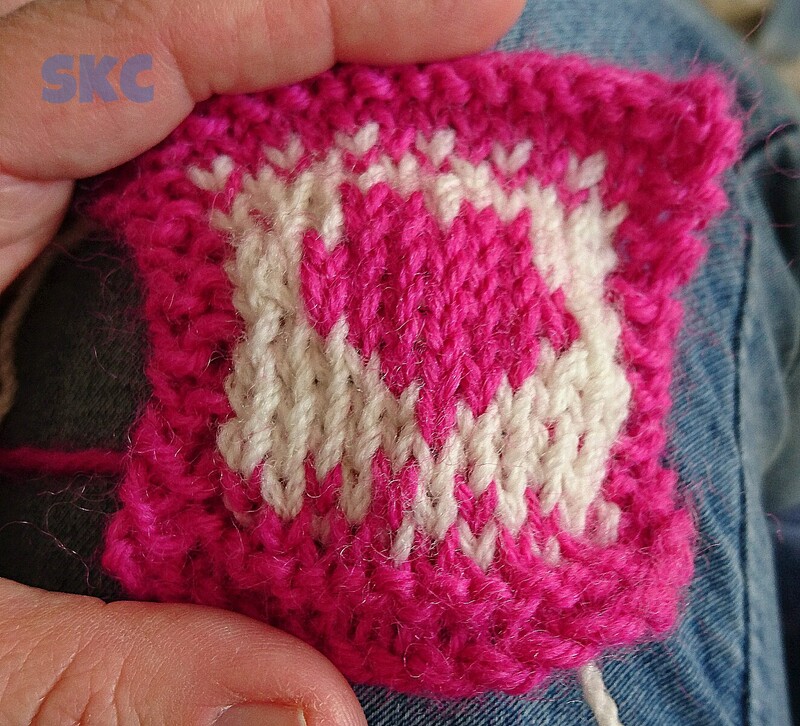 She decided she'd like to make a little pouch with a heart designed into it. 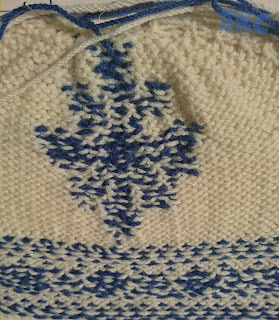 Now, we were at Gramma's house for the day, and Gramma is a knitting ninja. She knows so much about how to do things, and has a lovely stash of leftovers. So Princess got to choose some pretty wool, and was then equipped with knitting needles. She was ready to go! 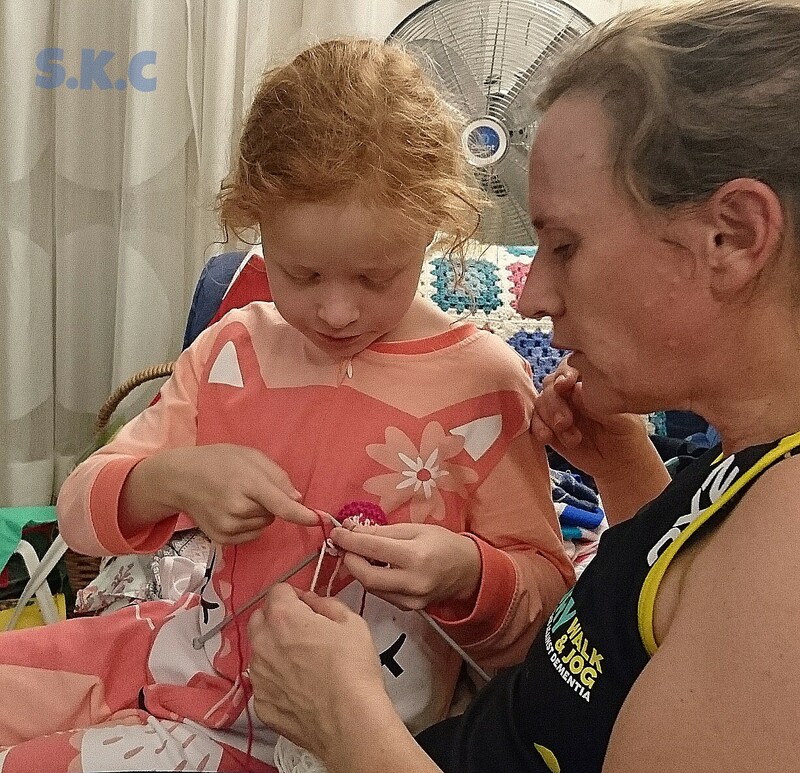 Princess knits moderately well for an 8 year old. Gramma and I have both taught her little bits, and then when I've been too slow to teach her something, she has a fabulous book that was given to teachers years ago by the Australian Wool Corporation, on how to knit for Children. So Princess has taught herself a lot. But at this point, she has only done garter stitch, no purling. We discovered (after some trial and error) that weaving colours really does require a stocking stitch (well, that was the only way we could get it to work without the yarns running across the front of the design - there are probably more experienced knitters who would know better). 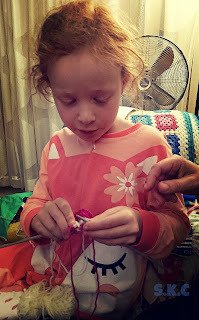 So we needed to teach Princess how to purl, at the same time as teaching her how to weave colours in (only about a day after I had taught myself). Gramma was able to tell us that most knitters these days do it this way, just passing the yarn along behind the knitting, however, the better way to do it is to weave the yarns in as you go. So lovely hearing the stories of her own mother's knitting skills, and the garments she created. 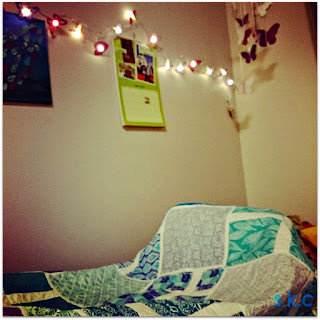 As we worked on Princess's design, we had much laughter, a lot of tinking, and eventually success: in learning how to weave the contrasting yarns in, and also in bringing her design idea to fruition. 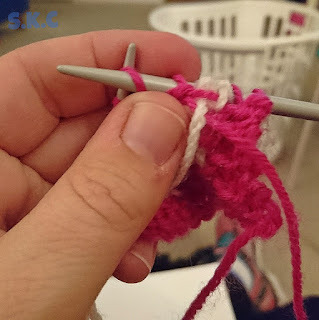 Wrapping the Yarn: I've got the white yarn (non-active) wrapped over the top of the pink yarn (active) which will keep it neatly woven in along the back. It was a team effort. 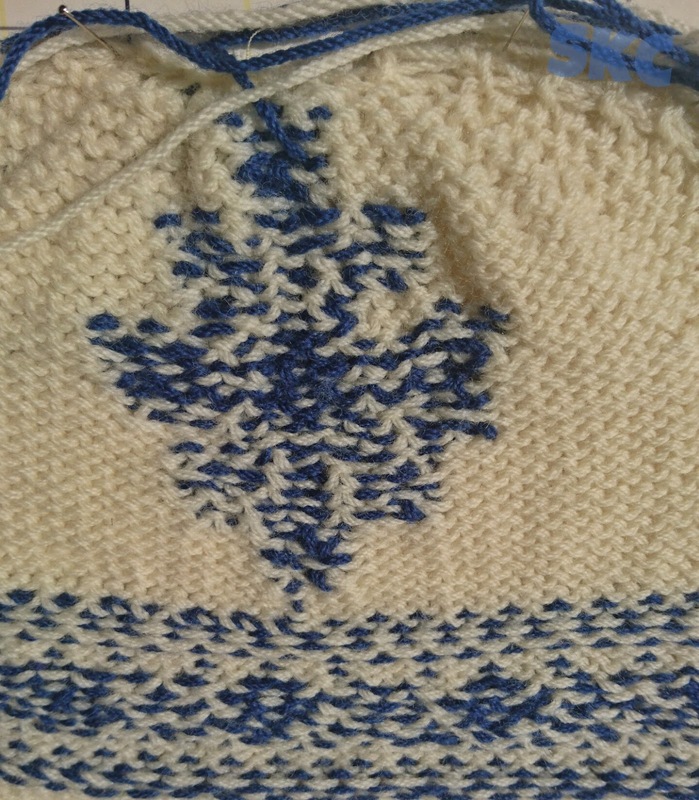 She knitted all the garter rows, I knitted the purl rows, and we took turns weaving the non-active colours in. 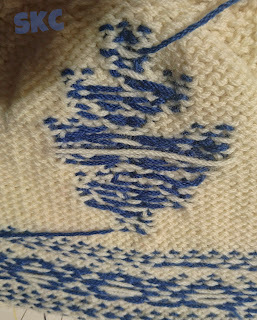 It was just a little fiddly, wrapping the yarn around the yarn being knitted with before each new stitch was cast. 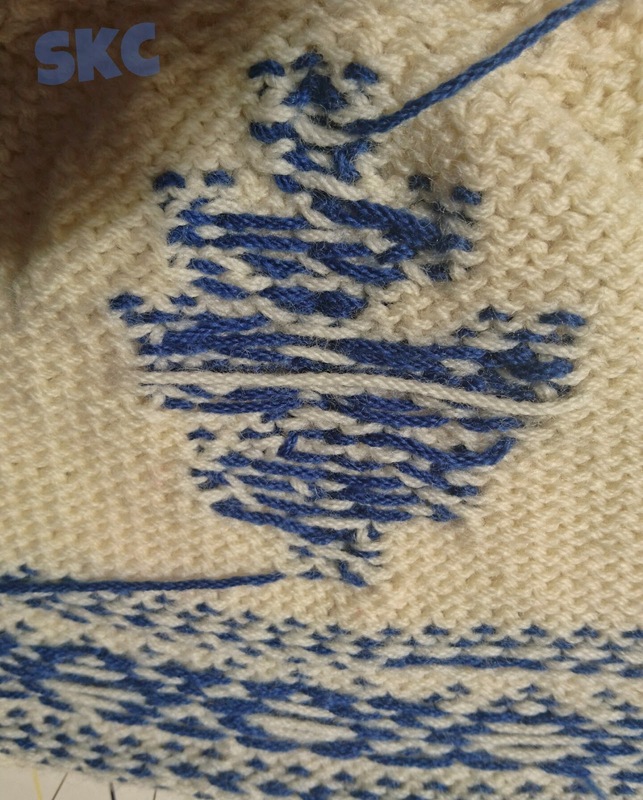 Here's a photo of the pattern made on the back of the knitting by wrapping the yarn each time. I love the effect of it! Back of the block, with yarn wrapped along the rows. Cool pattern! We are very proud of her design. 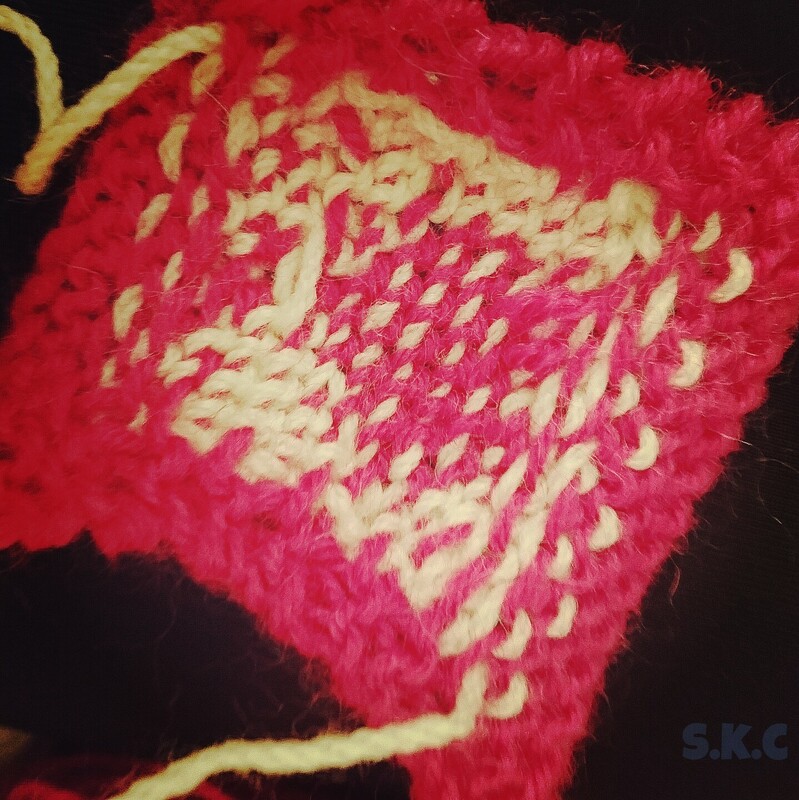 She's planning to make a second square and turn it into a little pouch. 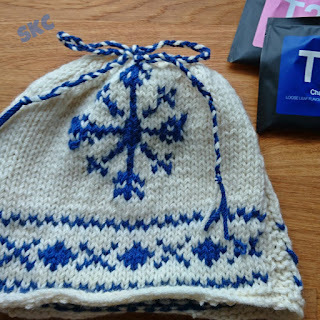 This inspired me to use a better technique for the second half of the Tea Cozy. 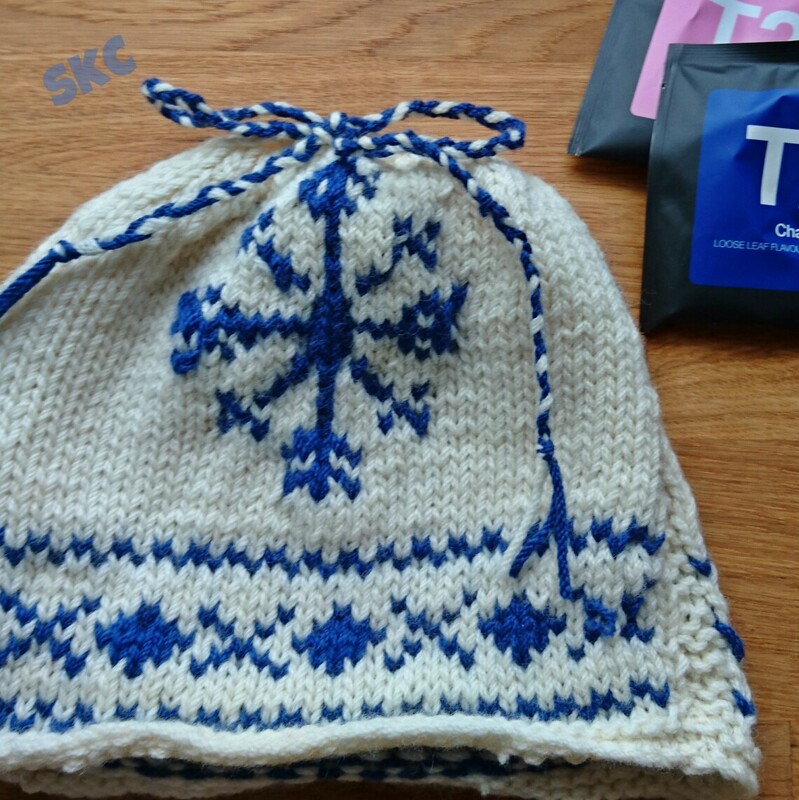 I blocked the finished products before sewing up - because the garter stitch along the bottom was making it curl up a lot. I kind of love blocking. It really is magic. You can see the difference between the two pieces. The cheat version looks a lot messier. It also doesn't have the right 'give' in it, because of the threads stretched across the back. The proper version looks a lot nicer, and doesn't have loose threads running across it. Because the threads were woven in along the way it meant they had enough length for the distance traveled. I think the proper version also has a better shape, because it doesn't have the threads pulling it too tight. All set now for some lovely hot cups of tea, no matter how chilly the weather. Although it will keep the tea warm, regardless, it was nice to master a better way of doing things. What do you think? 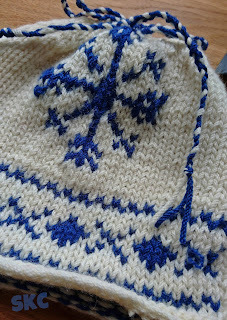 Have you ever done any colour work in knitting? 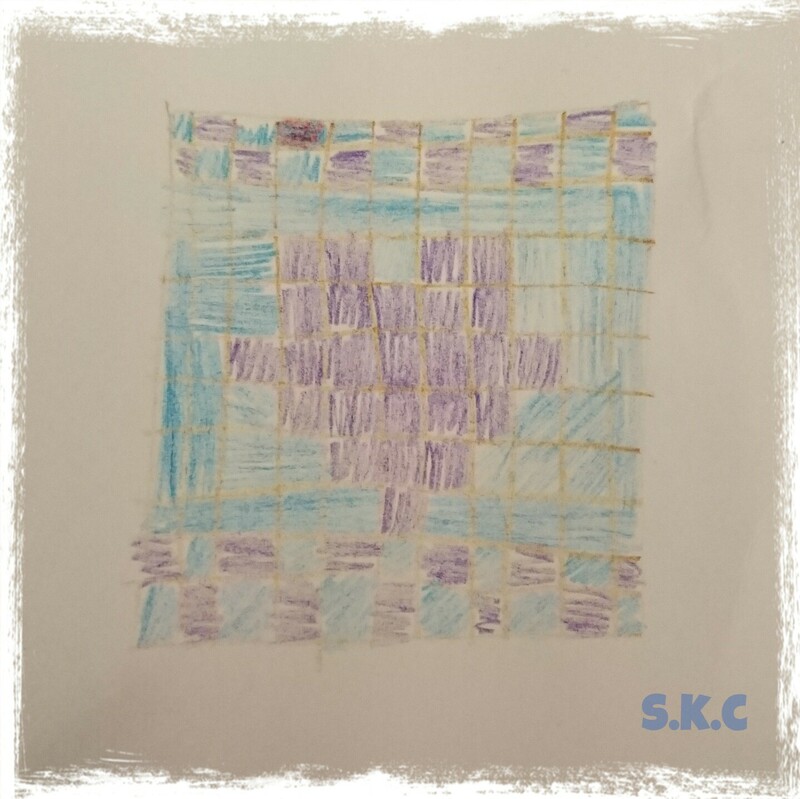 Did you know about weaving in the colours? Is it worth it? 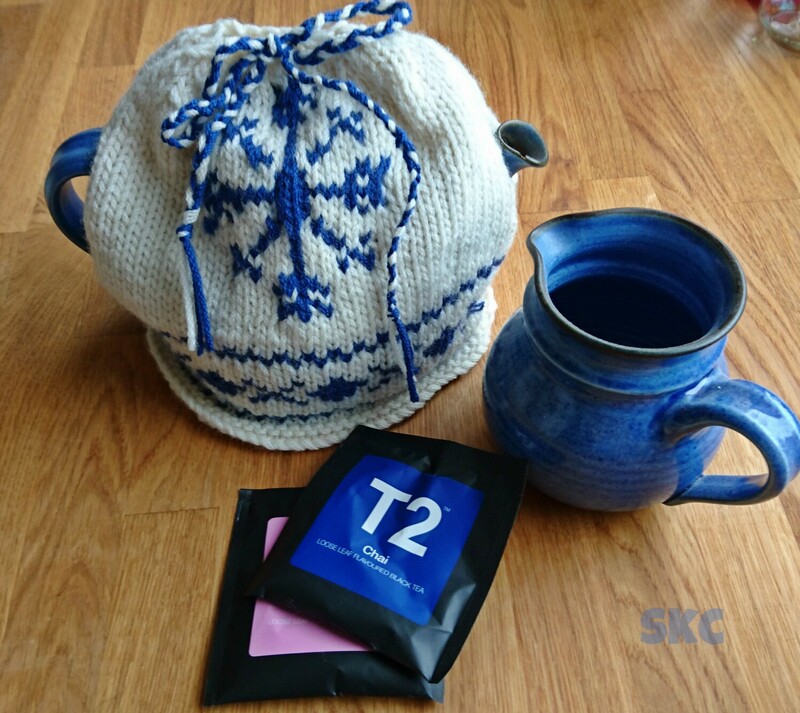 Come on over so I can share a cosy cuppa with you!